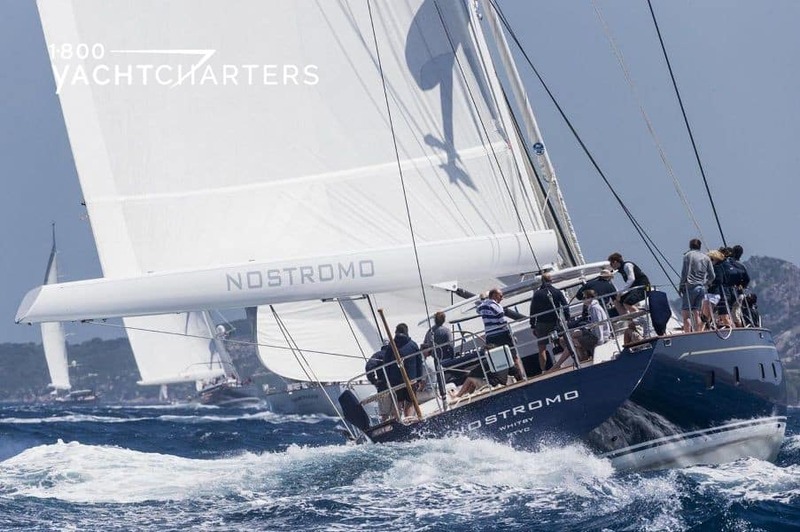 Looking forward to a strong Mediterranean yacht charter season, the 30 meter sail yacht NOSTROMO cruises into 2012 with highly-competitive, reduced rental rates. Beginning with the upcoming summer high season (July and August), rates have been slashed by 23% – from €45,000 per week to an attractive €35,000 per week. Rates are plus expenses. Launched in 2009, the sleek, modern sloop was designed by Dubois Yachts and built by British superyacht builder Pendennis. 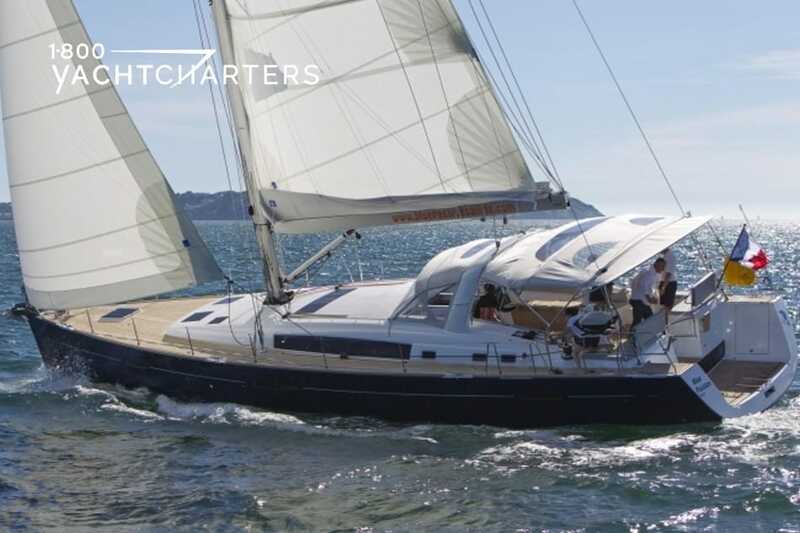 Since her arrival on the charter scene, Dubois sail yacht NOSTROMO quickly became a popular sailing yacht in France and Italy before crossing the Atlantic for service as a Caribbean yacht charter vessel. Pendennis yacht NOSTROMO boasts a beautiful interior, designed by Redman Whitely Dixon. There are four cabins that can be converted to offer 3 modern double cabins and 1 single cabin with a bath. 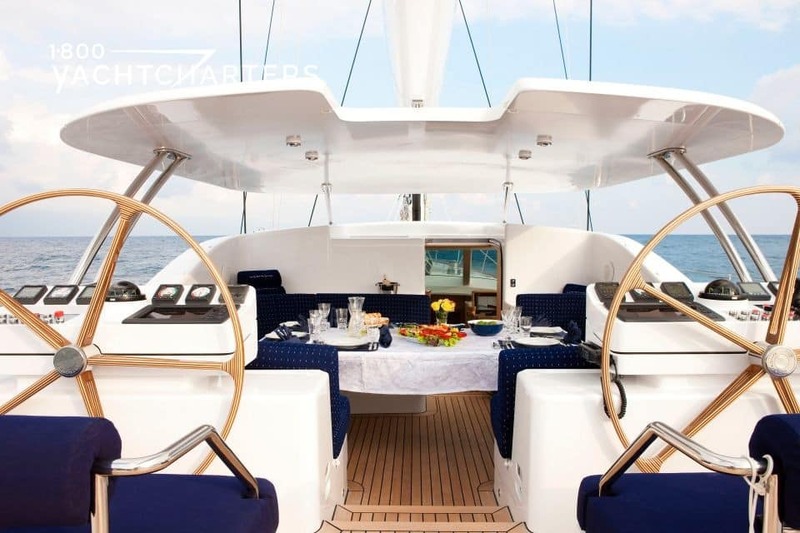 Available in the Eastern Mediterranean, her experienced crew is keen to charter. With attractive new rates, expect prime summer dates to be booked quickly. Similar yachts available this summer in the Eastern Mediterranean include the 43 meter sail yacht CLEAR EYES, 38 meter gulet yacht ESMA SULTAN, 34 meter sail yacht ANNAGINE, and the 32 meter crewed catamaran charters superstar sail yacht IPHARRA. On the heels of a glowing post-charter review by recent guests, sailing yacht catamaran DREAMING ON has announced a Thanksgiving crewed catamaran charters special. 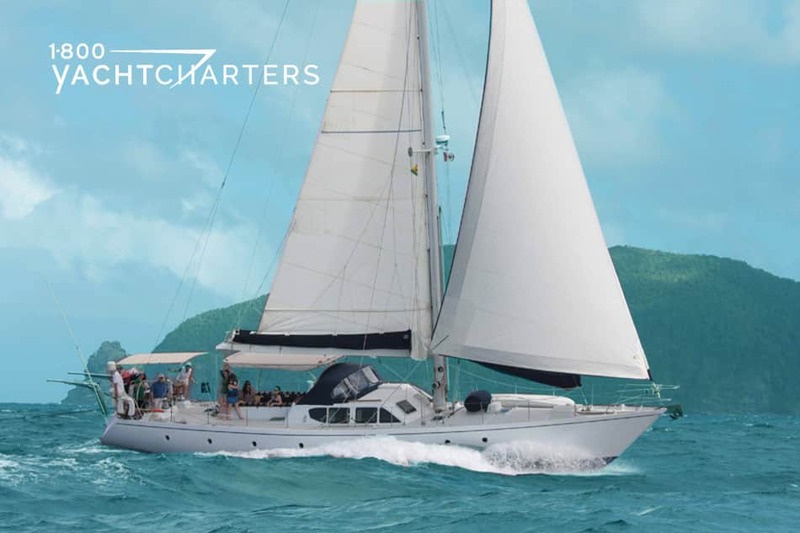 Launched in 2003 and immaculately maintained, crewed catamaran sailing yacht DREAMING ON is one of the most popular vessels offering crewed charters. 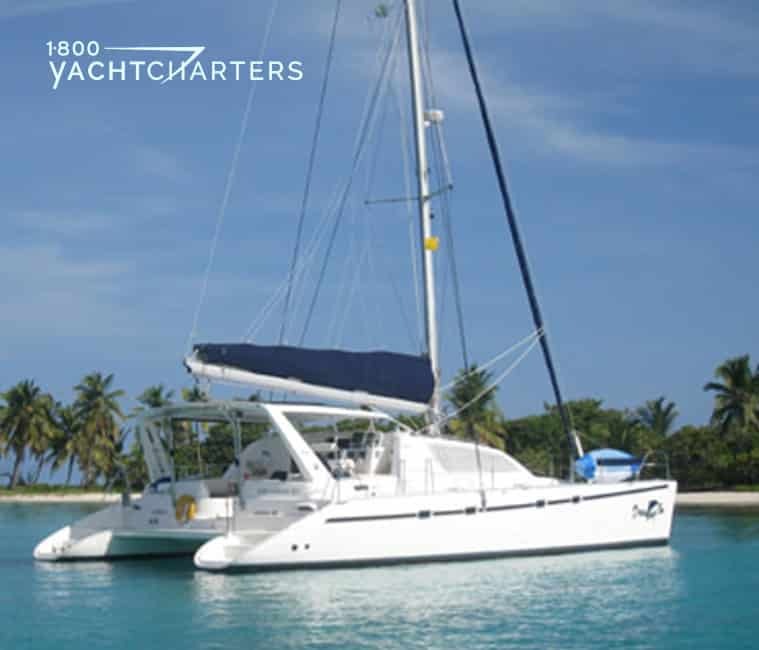 This Virgin Islands yacht charter vessel offers accommodations for 6 guests in 3 cabins, each with ensuite bathrooms. The yacht’s watertoy inventory includes towable toys such as a wakeboard, kneeboard, and a ski-tube, along with fishing and snorkel gear. Doing her part for the yachting industry’s ongoing GREEN initiative, the catamaran is equipped with wind scoops to limit the need for air-conditioning. Solar panels have also been installed to provide clean electricity. The crew also purchases earth-friendly paper products, biodegradable cleaning products, and local organic produce when available. 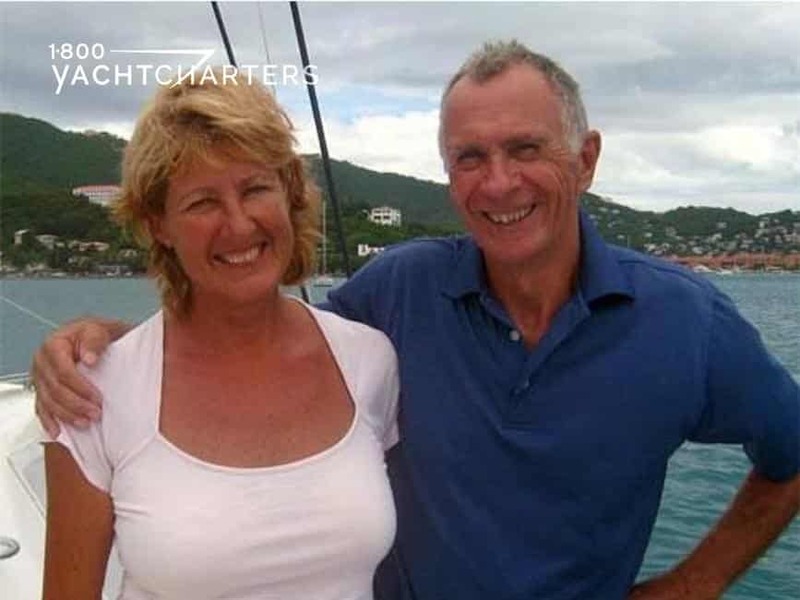 When not on charter, Geoff and Iza are often seen helping with reef and beach clean-up projects. 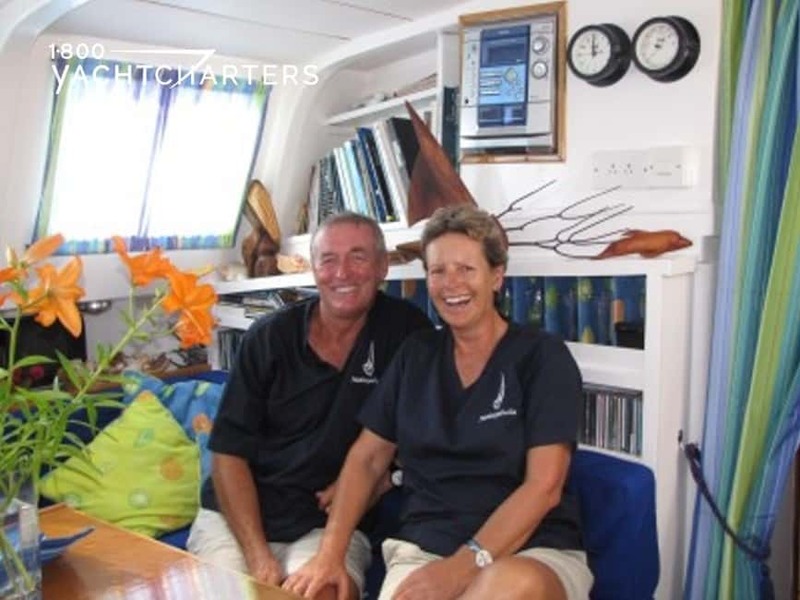 Available for Caribbean yacht charters, the yacht is based in the British Virgin Islands. Her published rate is $11,000 per week for 2 guests, $12,250 per week for 4 guests, and $13,250 per week for 6 passengers. Rates are inclusive of meals and the ship’s bar. 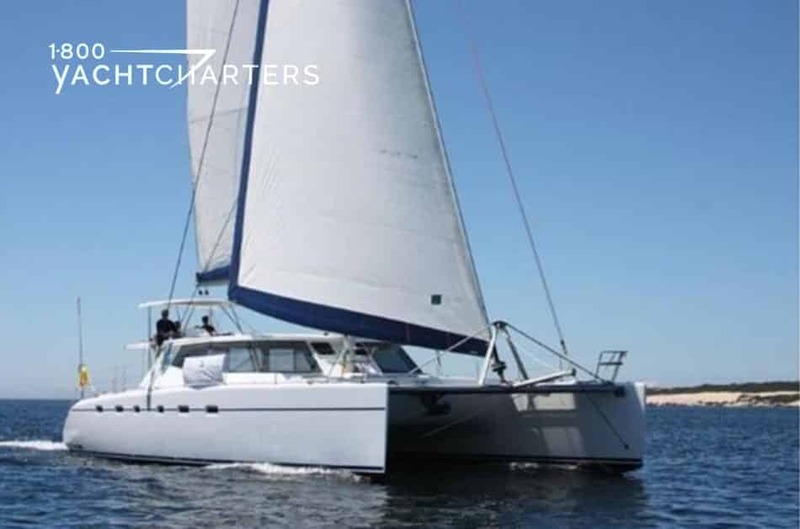 catamaran sail yacht AVALON ($26,000 per week, all inclusive), the 56′ catamaran sail yacht BACCHUS (€ 20,000 per week, all inclusive), and the 65′ sail catamaran WORLD’S END (€23,400 per week, plus expenses). 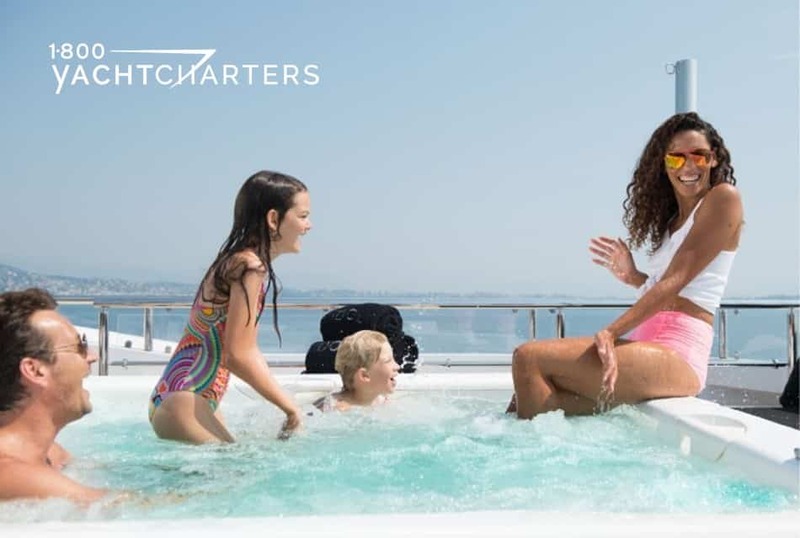 To arrange a last-minute holiday yachting vacation, contact the 1-800 Yacht Charters destination professionals at https://www.1800yachtcharters.com/book-now-contact-us/ today. With the global economy in disarray, planning an affordable family vacation is a real challenge. Fortunately, two yachts have just made sail boat charters a great option for a winter or spring break adventure. Sail yacht BLUE PASSION and sail catamaran NEXUS have announced special family charter rates. Subject to certain age restrictions, kids can travel FREE this winter and spring on either of these two Caribbean yacht charter vessels. The 58-foot sail yacht BLUE PASSION was built in 2010. She features 4 double cabins with an option for one aft cabin to convert to a twin cabin. All cabins are ensuite with separate showers and electric toilets. Her saloon is incredibly spacious and able to seat 12 people comfortably. On deck she offers a double sized sunbathing mattress to relax on. In her huge cockpit 12 people can sit around and enjoy her sailing performance. On her stern you will find a spacious aft deck perfect for landing fish, preparing to go diving and access for swimming. 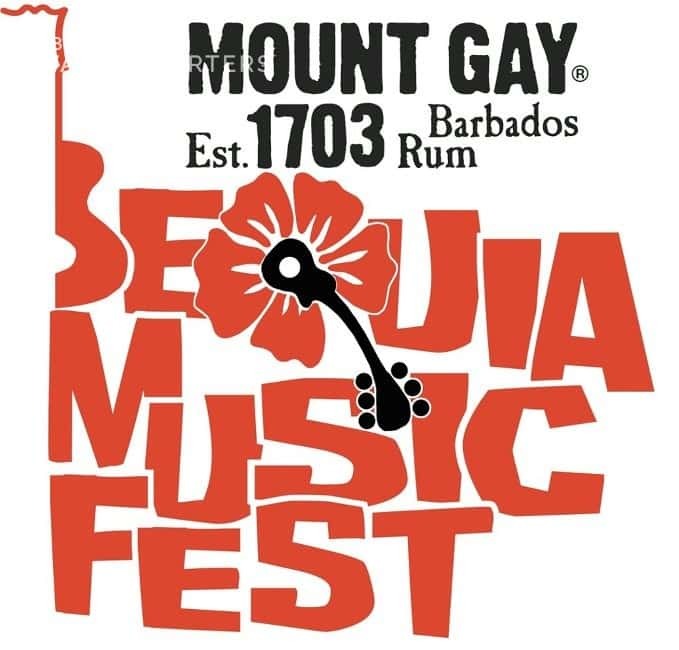 All inclusive rates start from $15,500 per week for 2 guests to $17,000 per week for 8 passengers with children 5 and under free through April 30, 2012. Launched in 2009, sail catamaran NEXUS features two king and one queen cabins. The king cabins can convert to twins, and one has an additional single berth. All offer ensuite bathrooms. The very spacious saloon is ideal for indoor relaxation and entertainment. The exterior cockpit features drop-down blinds for both privacy and protection for outdoor dining and lounging in all weather conditions. All inclusive rates start from $15,000 per week for 2 guests to $19,250 per week for 8 passengers. Children 10 and under are FREE through April 30, 2012. Come explore St Thomas and the U.S and British Virgin islands. 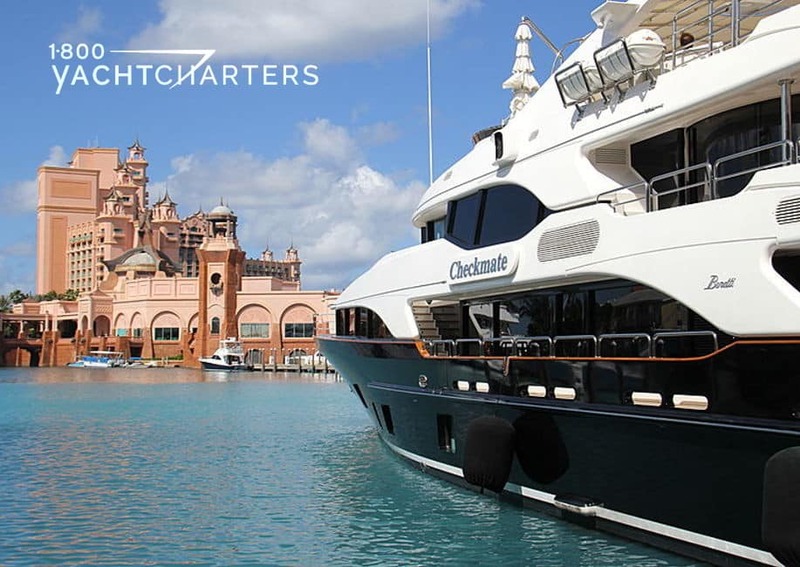 Contact the 1-800 Yacht Charters charter department at https://www.1800yachtcharters.com/book-now-contact-us/ for a list of yachts offering discounts and specials. 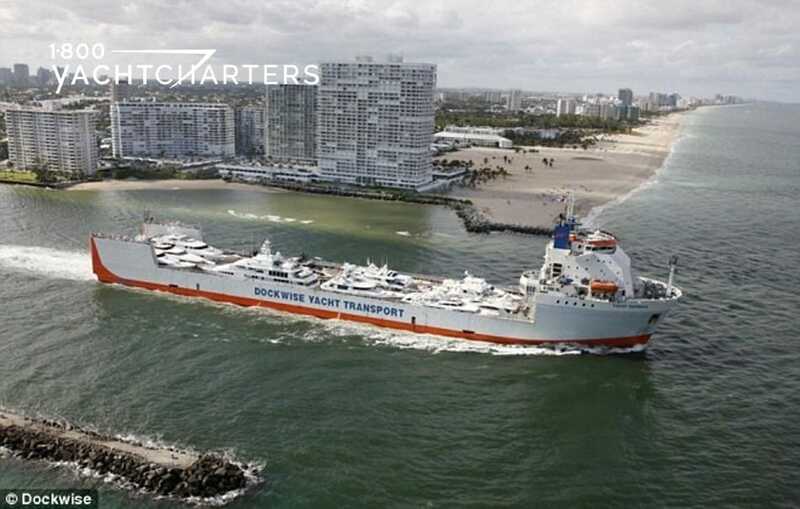 Earlier this week, the 686-foot (209 meter) Yacht Express, the flagship of Dockwise Yacht Transport’s (DYT) fleet of semi-submersible ships, pulled into Ft. Lauderdale. 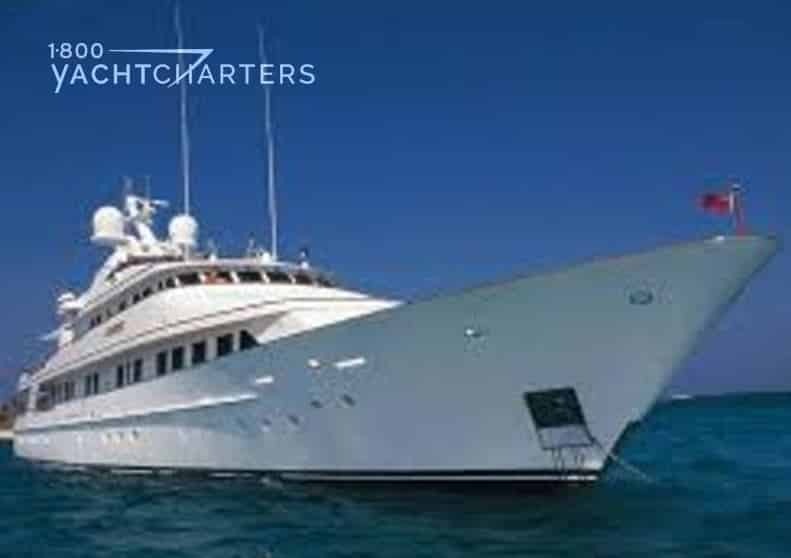 Onboard was a record breaking cargo of boats and luxury yacht charter vessels valued collectively at $270,341,000. The gray and orange-colored super ship took a berth at Port Everglades and began an hours-long de-ballasting process that allowed sea water to flood its dock bay. By early evening, 19 state-of-the-art luxury yachts safely motored out the back and into the waters of South Florida. The largest of the vessels to off-load was Trinity motor yacht MI SUENO #skyfall . The 190’ (57.91 meter) megayacht had loaded on to Yacht Express in Genoa, Italy on October 6. She had just returned from the Monaco Yacht Show and was delivered to South Florida to enter the Fort Lauderdale International Boat Show. Jana Sheeder, President of 1-800 Yacht Charters, further explains how wear and tear on a yacht during the Atlantic crossing is avoided by using a transport ship. Several of the other yachts on Yacht Express have shipped with DYT multiple times, including the 163’ (49.70 meter) motor yacht CASINO ROYALE, the 160’ (48.78 meter) ODESSA (four times each), the 161’ (49.09 meter) ZOOM ZOOM ZOOM (seven times), and the 132 foot (40.24 meter) motor yacht MISS ROSE. DYT had a second transport arrive from the Mediterranean this week. The ship Super Servant 4, arrived in Ft. Lauderdale on Friday from Palma de Mallorca, Spain, fully loaded with 24 yachts totaling $190,000,000 in value. Some of the sailboats were offloaded, bound for St. Thomas, USVI, in time for the Caribbean charter season. 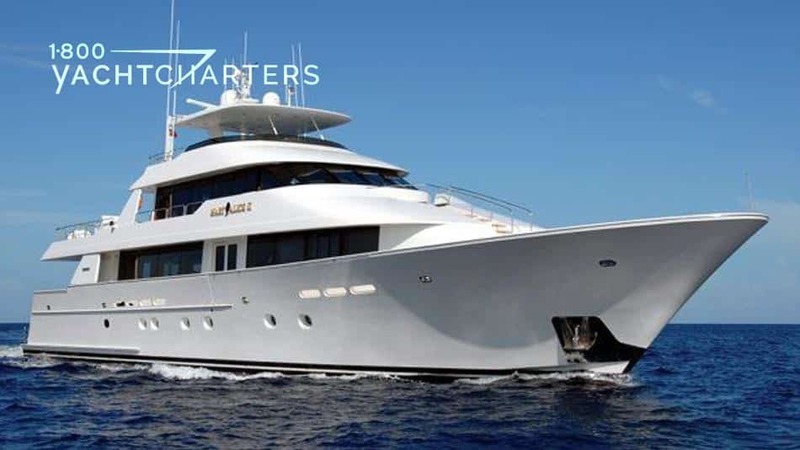 The 55 meter motoryacht HUNTRESS is available for a Caribbean yacht charter in the area of St. Vincent and the Grenadines for a holiday charter, between 15 December and 30 December, 2011. 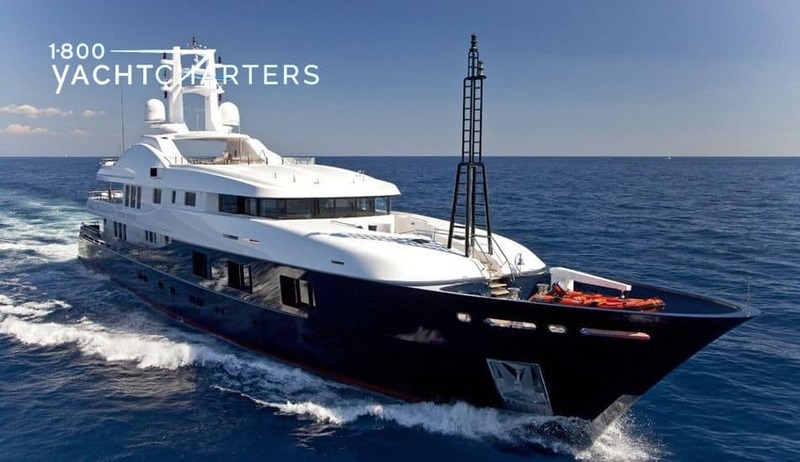 To entice Feadship yacht charter enthusiasts, she is offering 8 days for the price of 7 – a savings of nearly $40,000! With accommodations for up to 10 guests in 5 comfortable staterooms, Feadship motor yacht HUNTRESS is poised to visit the beautiful multi-island nation of St. Vincent and the Grenadines. Charter guests will enjoy a unique combination of fabulous cruising, rainforest eco-adventures, spectacular scuba diving and snorkeling, and classic Caribbean powder-white sand beaches. Captain Jeff Guymon and crew are keen to welcome you onboard!